Being iced in for the last 4 days we had a lot of time to get our frugal minds working on a bunch of different things. 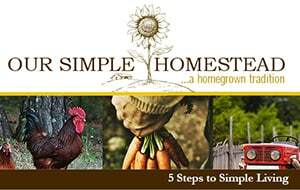 We spent the other morning ordering seeds and planning out our spring gardens, which now leaves us to gathering supplies to start our seedlings. My dad owned a greenhouse for years and oh how I wish I had some of those supplies now. But no such luck in raiding his barns looking for old trays that could be cleaned up and re-used since he lives 600 miles away! So back to our reuse and recycle mode. 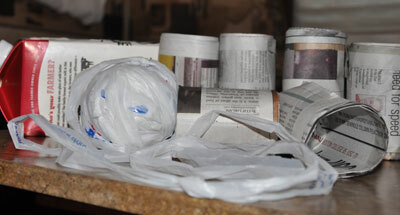 After some research on the Internet Craig found a way we can take old newspaper and make seedling pots. He made a few of them last night and from now until the seedling are ready to be transplanted he will continue to make the pots using our free weekly paper that comes every Thursday. Instead of buying seed trays I can use milk cartons laid on their side with one of the sides cut out. So other than having to buy bags of starter mix I think we have come up with items around the house we can reuse in the green house. 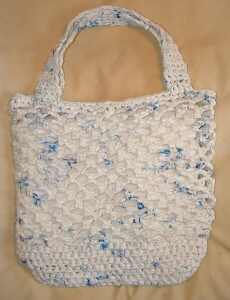 While we were researching I found a great use for all those plastic shopping bags we get from the grocery store. I don’t get many these days since I carry my own bags to the store and get a 5 cent rebate on every bag I bring from home but the ones I do get I am going to save and cut up to crochet additional re-useable shopping bags. Now I just have to locate a #10 crochet hook. I have to collect 47 plastic grocery bags to have enough to make one re-useable bag so while I am doing that I can be on the lookout for a new crochet hook. I will keep an eye out at the Goodwill maybe I will get lucky and find one so I don’t have to buy a brand new one. PreviousWhole Wheat Pancakes – Yummy good! Is there a pattern for knitting one instead of crocheting one? Have a great day! Yes there is…I thought of you when I saw it you might get yours made before me I still have to save more bags.